"Crown Princess" redirects here. For the ship, see Crown Princess (ship). "Kronprinz" redirects here. For the Imperial German Navy battleship, see SMS Kronprinz. 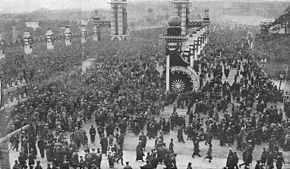 Throngs before the Imperial Palace in Japan awaiting the appearance of Crown Prince Hirohito for the recent proclamation of his official recognition as the heir apparent to the Japanese Imperial Throne -- New York Times, 1916. Crown prince as a descriptive term has been used throughout history for the prince being first in line to a throne and is expected to succeed (i.e. the heir apparent) barring any unforeseen future event preventing this. In certain monarchies, a more specific substantive title may be accorded and become associated with the position of heir apparent (e.g. Prince of Asturias in Spain, Prince of Wales in the United Kingdom). In these monarchies, the term crown prince may be used less often than the substantive title (or never). Until the late twentieth century, no modern monarchy adopted a system whereby females would be guaranteed to succeed to the throne (i.e. absolute primogeniture). A crown princess would therefore more likely refer to the spouse of a crown prince and would be styled crown princess not in her own right but by courtesy. The term crown prince is not used in monarchies wherein the hereditary sovereign holds a title below that of king/queen (such as grand duke or prince), although it is sometimes used as a synonym for heir apparent. In Europe, where primogeniture governed succession to all monarchies except those of the Papacy and Andorra, the eldest son or (more recently) eldest child of the current monarch fills the role of crown prince or princess, depending upon whether females of the dynasty enjoy personal succession rights. Primogeniture has been abolished in Belgium, Denmark, Luxembourg, Norway, Sweden, the Netherlands and the United Kingdom. The eldest living child of a monarch is sometimes not the heir apparent or crown prince, because that position can be held by a descendant of a deceased older child who, by "right of representation", inherits the same place in the line of succession that would be held by the ancestor if he or she were still living (for example, Carl Gustaf, Duke of Jämtland was the crown prince of Sweden from 1950 to 1973, as the senior grandson by male primogeniture of King Gustaf VI Adolf of Sweden, although the former Prince Sigvard, Duke of Uppland was Gustaf VI Adolf's eldest living son, and Prince Bertil, Duke of Halland his eldest living dynastic son during those years). In some monarchies, those of the Middle East for example, in which primogeniture is not the decisive factor in dynastic succession, a person may not possess the title or status of crown prince by right of birth, but may obtain (and lose) it as a result of an official designation made on some other legal or traditional basis, such as former crown prince Hassan bin Talal of Jordan. Compare heir apparent and heir presumptive. In Scandinavian kingdoms, the heir presumptive to the crown may hold a different title than the heir apparent: hereditary prince (German: Erbprinz, French: prince héréditaire). It is also the title borne by the heir apparent of Liechtenstein, as well as the heir apparent or presumptive of Monaco. In Luxembourg, the heir apparent bears the title of hereditary grand duke (German: erbgroßherzog, Luxembourgish: ierfgroussherzog); along with hereditary prince, it was also the title borne by the heirs apparent to the thrones of the grand duchies, sovereign duchies and principalities, and of mediatized princely families in the German monarchies abolished in 1918. Prince of Piedmont (Kingdom of Sardinia, and then Kingdom of Italy, when it was alternated with Prince of Naples) a title conferred by King Joseph Bonaparte to be hereditary on his children and grandchildren in the male and female line. Some monarchies have used (although not always de jure) a territorial title for heirs apparent which, though often perceived as a crown princely title, is not automatically hereditary. It generally requires a specific conferral by the sovereign, which may be withheld. Pavlos, Crown Prince of Greece. Reza Pahlavi, Crown Prince of Iran. Alexander, Crown Prince of Yugoslavia. Yuvaraja was part of the full title in many princely states of India, e.g. During the Joseon Dynasty in Korea, the crown prince was referred as Dong-gung(동궁, 東宮, 'East Palace') due to the location of his residence from the main palace; or wangseja (王世子 왕세자). He was not necessarily the first-born son, wonja (元子 원자). Siam Makutrajakuman (สยามมกุฎราชกุมาร) in Thailand since 1886. Krom Phrarajawangboworn Sathanmongkol or Phra Maha Uparaja or commonly called Wang Na (or Front Palace) in Thailand prior to 1886. Kanjeng Gusti Pangeran Adipati Anom in Yogyakarta sultanate and Surakarta, Indonesia. Raja Muda or Tengku Mahkota in the Malay sultanates of Malaysia. Ka Haku O Hawaiʻi or "The Lord of Hawaii" in the Hawaiian language. Aremo, "First Son and Heir" in the Yoruba language of West Africa, used as a royal title in many of the kingdoms of the region.